Between Two Castles of Mad King Ludwig has a physics-driven digital version available on Tabletopia (and on Steam). 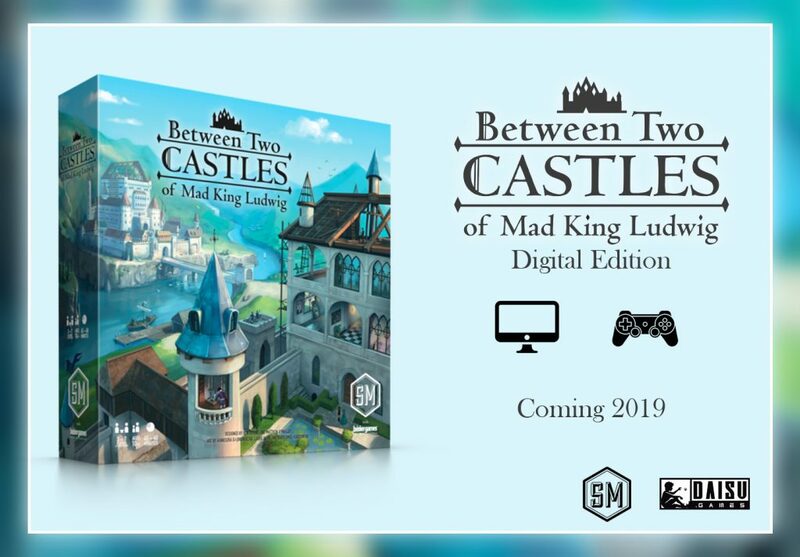 Daisu Games is working on the full-AI digital version of Between Two Castles of Mad King Ludwig. We don’t have a specific date, but they’re making great progress, and a late 2019 release is the target for all major platforms. Is there a rule that says once a tile is laid / placed that it cannot be relocated in a subsequent turn. I suspect not, although I don’t doubt that consent would be required from the relevant cooperative player. Right, as soon as you place a tile, you can’t relocate it. Thanks, I should have read the rule book more closely, I found the answer shortly after I sent the question. Thanks a lot for your prompt response though, I’m impressed.